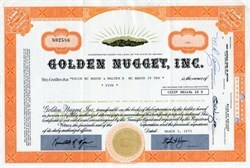 Beautiful certificate from Golden Nugget, Inc. issued in 1975. This historic document was printed by the Jeffries Banknote Company Company and has an ornate border around it with a vignette of an the company's name and a shinning golden nugget. This item has the signatures of the Company's President, Steve Wynn and Secretary, and is over 39 years old. After the Nevada legislature legalized gambling in 1931, Las Vegas became the scene of several small gambling establishments. In 1938, Guy McAfee arrived in Vegas. McAfee had previously served in the Los Angeles Police Department's vice squad. Unfortunately for him, he also was running various gambling houses, which came to light and forcing his resignation. Facing possible legal action, McAfee moved to Las Vegas and bought a club, naming it the "91 Club." In 1945, McAfee, along with investor G.C. "Buck" Blaine, began overseeing the construction of the Golden Nugget on downtown Las Vegas' Fremont Street. The Golden Nugget opened in August 1946 with mahogany bars, imported marble floors and crystal chandeliers. When the Golden Nugget opened, it was the largest and most luxurious casino in downtown Vegas. Its opening date also makes it one of the oldest casinos in Vegas. In 1951, the Golden Nugget was incorporated and McAfee became the company's first president. McAfee retired in 1960 and Buck Blaine became the next president. During the 1960's, Blaine and the corporation purchased adjoining Fremont Street properties to enlarge the Golden Nugget. However, the casino remained just that -- a casino. That would change in 1972 when developer Steve Wynn purchased a stake in the Golden Nugget operations. The Golden Nugget was originally built in 1946, making it one of the oldest casinos in the city. Jackie Gaughan at one time owned a stake in the hotel as part of his many downtown properties. Steve Wynn bought a stake in the Nugget, which he increased so that, in 1973, he became the majority shareholder, and the youngest casino owner in Las Vegas. In 1977 he opened the first hotel tower and the resort earned its first four diamond rating from Mobil Travel Guide. It was the foundation for Wynn's rise to prominence in the casino industry. The second hotel tower opened in 1984 along with the showroom, and the third tower was opened in 1989. On May 31, 2000, the Golden Nugget (and all of Steve Wynn's other properties) was sold to Kirk Kerkorian; the consolidated corporation was known as MGM Mirage and has been the largest casino corporation in Las Vegas since that date. 1995 The Fremont Street Experience opens, transforming the world's most famous neon street into an urban theater with landscaped paths, and a 90-foot tall, 4-block long �space frame� with multi-sensory light shows choreographed to booming symphonic sound-boasting 2.1 million lights and 540,000 watts of sound - and has enhanced the attraction of Downtown Las Vegas.